"Delicious, quick and easy dish to prepare! Best when caught fresh, but can use frozen. Made this recipe up when I was about 14, still it is one of my favorites!!!" In a medium saucepan, melt the butter on low heat; cool to room temperature. Meanwhile, in a medium bowl, combine the cayenne pepper, black pepper, lemon pepper, garlic powder and salt. Set aside. Dip the filets into the melted butter, then coat with the seasoning mixture. In a large skillet over high heat, sear fish on each side for 2 minutes or until slightly charred. Place in a 11x7 inch baking dish and pour the Italian dressing onto each filet. Cover baking dish and bake in a preheated oven for 30 minutes or until flaky and tender. Big taste difference from the Louisiana original (from Chef Paul Prudhomme) with half of the spices. If you like hot and spicy cajun food you'll love this recipe. Absolutely delicious! 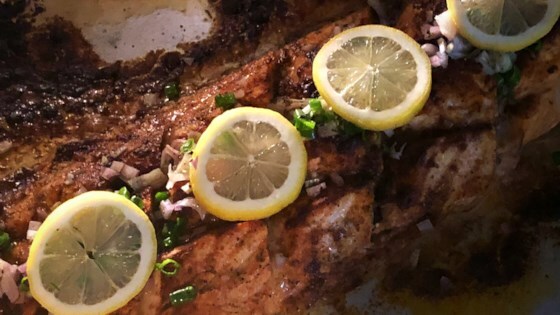 While this recipe does sound tasty, members should be aware that it is not the original, authentic "Blackend Redfish" that was made famous in New Orleans and around the world. Smply Delisious! I will try this dish again.